Highland Park in Los Angeles has long been a diverse and vibrant community. In the last few years, however, 20- and 30-somethings, lured by the neighborhood’s affordable rents and proximity to downtown Los Angeles, have moved in and are giving local entrepreneurs a new incentive to open new restaurants, bars and boutiques. Many are on old Figueroa Street, now a vibrant thoroughfare full of pedestrians. A bar, restaurant and bowling alley all in one space: originally a popular bowling alley dating back to 1927, this sprawling space was a punk rock music venue until a local hospitality company, 1933 Group, took it over and restored it to its former glory with the original bowling lanes, candy machines and placards. There’s also a Neapolitan pizza restaurant and four bars. 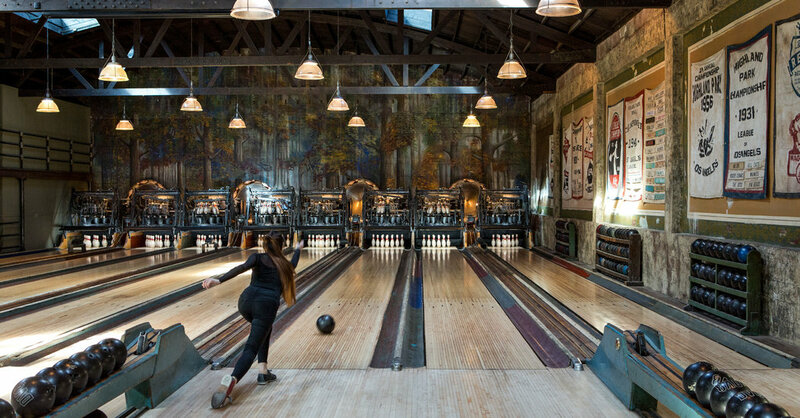 Bowling is $50 per hour per lane; each lane accommodates six people. In 2016, a former clothing store became a Mediterranean restaurant serving refined dishes in a laid back setting of high vaulted ceilings, copper tables and a long white marble bar. Renata Rokicki, the executive chef, aims to create approachable dishes using seasonal ingredients such as Moroccan spiced fried chicken and a citrus salad with pistachios and ricotta. Most dishes can be shared, and there’s a strong cocktail program. A meal for two people with a cocktail each is about $60.